Tyrol (/tɪˈroʊl, taɪ-, ˈtaɪroʊl/; German: Tirol [tiˈʁoːl] ( listen); Italian: Tirolo; Slovak: Tirolsko) is a federal state (Bundesland) in western Austria. It comprises the Austrian part of the historical Princely County of Tyrol. It is a constituent part of the present-day Euroregion Tyrol–South Tyrol–Trentino (together with South Tyrol and Trentino in Italy). The capital of Tyrol is Innsbruck. The state of Tyrol is separated into two parts, divided by a 7-kilometre wide (4.3 mi) strip. The larger territory is called North Tyrol (Nordtirol) and the smaller area is called East Tyrol (Osttirol). The neighbouring Austrian state of Salzburg stands to the east, while on the south Tyrol has a border with the Italian province of South Tyrol (Trentino-Alto Adige/Südtirol) which was part of the Austro-Hungarian Empire before the First World War. With a land area of 12,683.85 km2 (4,897.26 sq mi), Tyrol is the third-largest state in Austria. Tyrol shares its borders with the federal state of Salzburg in the east and Vorarlberg in the west. In the north, it adjoins to the German state of Bavaria; in the south, it shares borders with the Italian province of South Tyrol and the Swiss canton of Graubünden. East Tyrol also shares its borders with the federal state of Carinthia to the east and Italy's Province of Belluno (Veneto) to the south. The state's territory is located entirely within the Eastern Alps at the Brenner Pass. The highest mountain in the state is the Großglockner, part of the Hohe Tauern range on the border with Carinthia. It has a height of 3,797 m (12,457.35 ft), making it the highest mountain in Austria. In ancient times, the region was split between the Roman provinces of Raetia (left of the Inn River) and Noricum. From the mid-6th century, it was resettled by Germanic Bavarii tribes. In the Early Middle Ages it formed the southern part of the German stem duchy of Bavaria, until the Counts of Tyrol, former Vogt officials of the Trent and Brixen prince-bishops at Tyrol Castle, achieved imperial immediacy after the deposition of the Bavarian duke Henry the Proud in 1138, and their possessions formed a state of the Holy Roman Empire in its own right. When the Counts of Tyrol died out in 1253, their estates were inherited by the Meinhardiner Counts of Görz. In 1271, the Tyrolean possessions were divided between Count Meinhard II of Görz and his younger brother Albert I, who took the lands of East Tyrol around Lienz and attached it (as "outer county") to his committal possessions around Gorizia ("inner county"). The last Tyrolean countess of the Meinhardiner Dynasty, Margaret, bequeathed her assets to the Habsburg duke Rudolph IV of Austria in 1363. 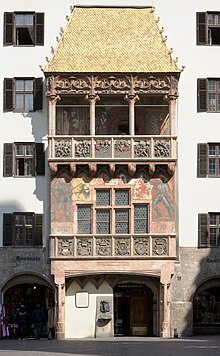 In 1420, the committal residence was relocated from Merano to Innsbruck. The Tyrolean lands were reunited when the Habsburgs inherited the estates of the extinct Counts of Görz in 1500. 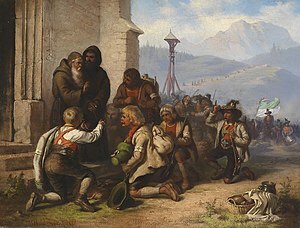 In the course of the German mediatization in 1803, the prince-bishoprics of Trent and Brixen were secularized and merged into the County of Tyrol (which in the next year became a constituent land of the Austrian Empire), but Tyrol was ceded to the Kingdom of Bavaria in 1805. Andreas Hofer led the Tyrolean Rebellion against the French and Bavarian occupiers. Later, South Tyrol was ceded to the Kingdom of Italy, a client state of the First French Empire, by Bavaria in 1810. After Napoleon's defeat, the whole of Tyrol was returned to Austria in 1814. Tyrol was a Cisleithanian Kronland (royal territory) of Austria-Hungary from 1867. The County of Tyrol then extended beyond the boundaries of today's state, including North Tyrol and East Tyrol; South Tyrol and Trentino (Welschtirol) as well as three municipalities, which today are part of the adjacent Province of Belluno. After World War I, these lands became part of the Kingdom of Italy according to the 1915 London Pact and the provisions of the Treaty of Saint Germain. Since November 1918 it was occupied by 20,000–22,000 soldiers of the Italian Army. After World War II, Tyrol was governed by France until Austria regained independence again in 1955. A view from the tower of the old townhall to Innsbruck Cathedral. Tyrol has long been a central hub for European long-distance routes and thus a transit land for trans-European trade over the Alps. As early as the 1st century B.C. Tyrol had one of the most important north-south links of the Roman Empire, the Via Claudia Augusta. Roman roads crossed the Tyrol from the Po Plain in present-day Italy, following the course of the Etsch and Eisack in present South Tyrol over the Brenner and then following the northern Wipp valley to Hall. From there roads branched along the River Inn. The Via Raetia went westwards and up onto the Seefeld Plateau, where it crossed into Bavaria where Scharnitz is today. The Porta Claudia, built in the early 17th century is a fortification that underlines the importance of the road in the Early Modern Period. Today Tyrol has international road, rail and air connections. Innsbruck Airport is Tyrol's international airport. In addition there are several smaller airports in various places such as St. Johann in Tirol, Höfen in the Außerfern or Langkampfen. Many ÖPNV companies operate a common tariff scheme as part of the Tyrol Transport Association. ^ "Tyrol". Random House Webster's Unabridged Dictionary. ^ "Tyrol, Austria". Lonely Planet. Retrieved 1 November 2016. Wikimedia Commons has media related to Tyrol (state). Wikivoyage has a travel guide for Tyrol.